Ken Weaver is a professional beer writer editor based in Petaluma. His 'Northern California Craft Beer Guide,' with photography by Anneliese Schmidt, is out now. It is conceded that Sonoma County produces the finest quality of hops grown on the Pacific Coast. While the yield is not so heavy as in some other sections of the State, there is more lupulin and a stronger aroma in the Sonoma County product, which brings from one cent to two cents per pound more money in the market. By the time we arrive, the pickers have been at work for hours. A worn, construction-yellow backhoe loader silently blocks one of the two driveways leading into Carneros Brewing Co. in Sonoma, its scoop reaching up 10 feet into a curtain of green. Turning into the second of the brewery's inlets, we spot three of the pickers (family and friends of the company owners) walking amid aisles of 20-foot-high trellises, slowly filling their buckets. 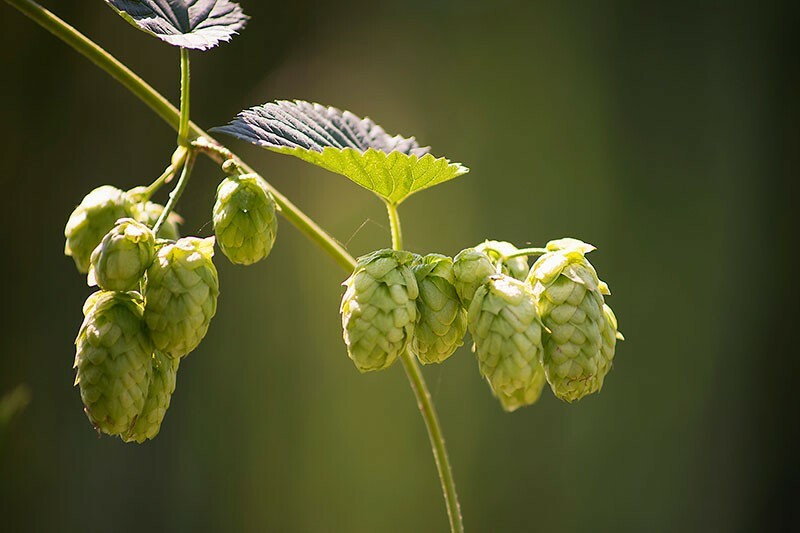 Hops are one of the four core ingredients in modern beer production, in addition to malted barley, yeast and water. For the uninitiated, they resemble small upside-down artichokes, or soft green pine cones. To beer cognoscenti, they're essentially squishy buds of awesome. All told, they're ultimately the flowers (or "cones") of the vinelike perennial Humulus lupulus. Essentially, we're witnessing one of the earliest stages of beer making, and one that, from a wider angle, has been part of this region's agronomic makeup for around 150 years. And yet today, despite the unchecked craft-beer boom, and despite the increased ubiquity of farm-to-table this and locavore-minded that—even despite the fact that certain folks (right here) will occasionally stand outside of Russian River Brewing Co. for hours awaiting what's ultimately a mouthful of hops—the actual epicenter of American hop production has long since shifted elsewhere. To understand why, exactly, requires first going back to a time when hops outpaced even grapes as a dominant crop in Sonoma County. We've come to Carneros Brewing Co., in particular because this is about as close to the hop-growing heritage of Sonoma County as one can get. As the craft-beer industry continues to grow, an increasingly large percentage of North Bay breweries are cultivating their own small sub-acreage of hops, but these are typically used immediately—in a single batch or two of beer—upon harvest. While Washington, Oregon and Idaho produce the vast majority of commercial hops grown in the United States today (again, most of which are dried), Sonoma County was a significant hop-producing region as recently as 60 years back. Vestiges of our area's earlier hop industry can be found in the abandoned kilns seen alongside the backroads of Sonoma County, the Walters Ranch Hop Kiln (dating back to 1905) that now serves as the tasting room for HKG Estate Wines in Healdsburg and in the hop yard of the Windsor Historical Society, where hops engendered from 70-plus-year-old Sonoma County bines grow. A few New England states, plus scattered plots in Wisconsin, were the key U.S. hop growers around the mid-1800s, before production (like the population) drifted westward. At the heart of that shift was Northern California, particularly Sacramento and its surroundings, with Sonoma, Mendocino and Yuba counties following suit. Whole families would camp in the fields during harvest. Horse-drawn carts would pass carrying 15-foot stacks of hop bales. For the curious, Tinged with Gold: Hop Culture in the United States by Michael A. Tomlan (kindly lent to me by Moonlight Brewing's Brian Hunt) has proven to be an exceptional resource on the subject. Tomlan reports: "From 1915 until 1922 California was the leading hop-producing state in the Union, responsible for over 50 [percent] of the total U.S. production in some years; the state's acreage peaked in 1916." As to the reason for this ascent, Tomlan writes that "whereas in the East or in England, growers might complain that the crop never fully matured from lack of sunshine, too much rain, or mildew, in California this never seemed to be the case." Prohibition wasn't especially kind to U.S. hop growers, obliging them to rely on international markets. California, in particular, took a major acreage hit. Sonoma County was one of a few to recover afterward, peaking with the 1945 harvest, when about 25,000 bales generated $2.6 million. It wouldn't last for long. A further major setback occurred with the 1948 harvest, which saw an unhelpful triad of hop mildew, aphid infestation and weak market conditions (as highlighted by the Sonoma County Department of Agriculture's annual harvest report). Production, with basically the same acreage as the preceding year, dropped by nearly 40 percent. The industry would again temporarily recover in the next few years, even seeing a slight uptick in acreage overall. Nineteen fifty-one, however, brought cold weather and lower yields, and the following year's report read: "Hop producers had a disastrous year. Prices were lower; sixty-five percent of the crop was harvested under [unfavorable terms]; and, in addition, considerable acreage was abandoned. On the other hand, hay growers had an excellent year with good yields and prices." Hay, sadly, is for horses. Acres once allocated to hop production transitioned to crops of green beans and Fordhook lima beans (the latter proving to be an almost-immediate bust). Others returned to orchards, or grapes. Some of the silenced hop kilns, according to Tomlan, "turned into berry, fruit, or fish dryers." By 1961, Sonoma County harvest reports ceased mentioning hop operations altogether. Carneros just opened this summer, but this is already its third hop harvest. Brewmaster Jesus Ceja, an exceptionally experienced brewer with 15 years at Anheuser-Busch (and, post-merger, Anheuser-Busch InBev), had been using earlier harvests for his test batches. The brewery launched with five core beers in its lineup—a pilsner, an amber ale, both a regular and black IPA, and (a personal highlight) a German-style Hefeweizen—all of which use some of these estate-grown hops. Carneros' plants will provide about 30 percent of the brewery's annual requirement. Carneros currently grows four different varieties of hops: Tomahawk (used for its potent bitterness), Cascade (another American type, renowned for its citrusy flavors and aromatics), plus Hallertau and Saaz (two classic European varieties, more on the spicy-earthy side of the spectrum). Beneath the shade of Carneros' outside pouring station—seriously, the place is pretty darn plush for a small brewery—I ask Ceja how he can tell them apart. Even to someone who writes about beer for a living, they all look like squishy green pinecones to me. It's a matter of both sight and smell. I hand Ceja the hop that I'm holding, which he takes in two fingers and briefly inspects, before putting it up to his nose to be sure. "This is Saaz," he replies, without hesitation. Noting the "it still looks like a pinecone" expression on my face, he adds that this one has more of a three-dimensional shape to it than, say, the tighter-clustered Tomahawk. Then there's the proportion of aromatics: vegetal notes, grassiness, slight citrus. I take the hop in question over to where my friends have congregated, halving it with my fingernails. It's not the first time I've sliced open a hop, but every time it's like looking in on a tiny, hidden world. Or at least a tiny hidden apartment complex. Discrete pockets along both sides of the hop's inner stem house what appears to be pollen but in fact are the lupulin glands; i.e., the reason hops matter. The alpha and beta acids stored within the glands are responsible, after they're boiled, for the hops' main bittering contribution to beer, while the hop oils (also resident in the lupulin glands) contribute myriad flavors and aromas—depending on the variety, everything from pithy grapefruit to Sauvignon Blanc to spearmint. Soft yellow smudges from the lupulin dot my notebook, as if I've been cooking with saffron. Our party heads back to one of the pergola-covered tables in Carneros' garden, unpacking a picnic lunch and sipping cold pints of Jefeweizen and Negra IPA. We can see the pickers as they slowly make their way down the rows, handfuls of hops disappearing into buckets. The bines (with a b), as they climb the trellises—via scratchy hairs and robust stems, differently than a true vine would—begin to slacken. With luck, the pickers will pull 500 pounds again this year. Relative to most other breweries growing hops locally, that's huge. Compared to commercial hop-growing operations farther north, however, it's barely a drop in the bucket. Though North Bay production today tends to be on a gentle upswing, there's minimal chance of a return to the huge volume of Sonoma County's heyday. Kilns are expensive (even Carneros simply dries its hops in the open air, using ventilation efforts instead of a full-blown hop kiln), and breweries aren't particularly inclined to get into the hop-growing business when their focus should be on the final outcome. But these are secondary points. Economic force, both in terms of grapes here or economies-of-scale elsewhere, has shifted around enormously in the decades since. One really can't complain about the quality of hops from large-scale, mechanized enterprises in the Pacific Northwest, nor about those companies' cultivation and research programs, which introduce expressive new varieties each year. But we're blessed with a surplus of great local breweries that, because their small-scale harvests never see a kiln, go all out in producing wet-hop beers at harvest, which afford a freshness and aromatic quality that one simply doesn't get from dried hops. We've rounded up as many as we could in the sidebar. 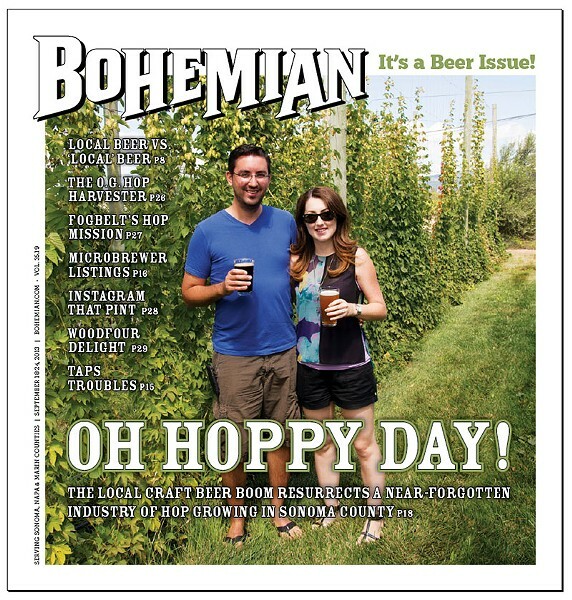 Once a year, at least, it almost feels like the hop industry never left.